Good morning my friends, I have such a cool review for you today. I think something that will appeal to all the ladies and would make a wonderful addition to your homes. I'm talking about Spiral Light Candles. 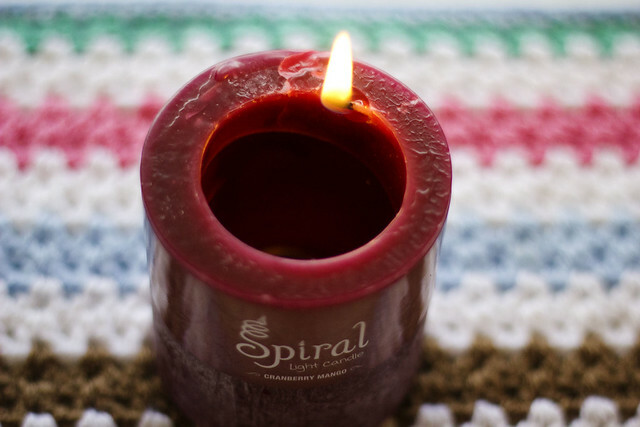 A few weeks ago I was asked to review the Spiral Candle. Now I have never heard of the product until that moment and was quite intrigued. When I received the box and opened it, the first thing that hit me was the amazing scent. Oh goodness, it wafted through the entire kitchen and even the kids asked what it was. Cranberry Mango and oh my word does that smell divine. Not a combination I would have thought to put together, and usually I steer away from fruity smells, they're not my favorite, but this one is amazing. Here's the candle when first lit up. The concept of these candles is so neat, unlike anything I had seen before. Spiral Light self-filling candles are a new twist on an old staple. 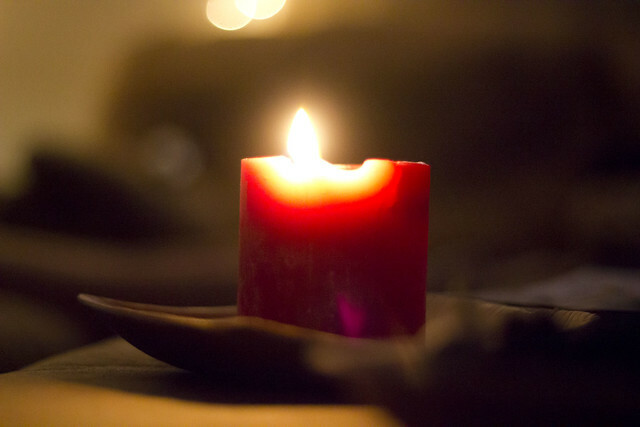 The self-filling candle is first lit, using the horizontal wick on the upper edge. 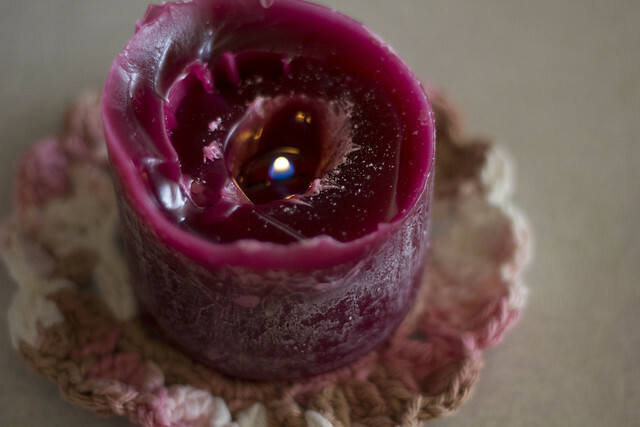 The candle burns around the hollow center with the wooded wick allowing the wax to drain inward, filling in the center. 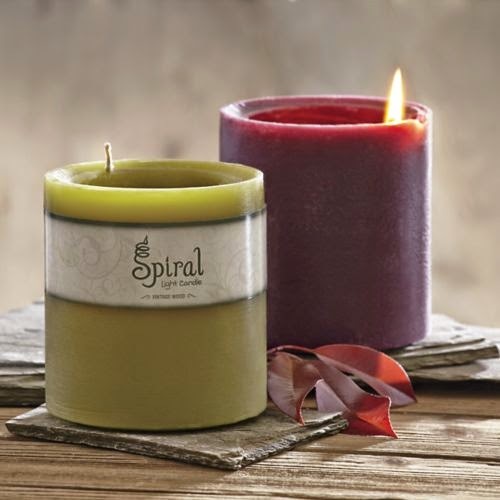 The horizontal spiraling wick self extinguishes when the inside wax level reaches the top of the spiral, to prevent any spilling.This creates a solid pillar candle. I let it burn for a few nights, and when it wasn't burning it was almost like an air freshener, it is THAT fragrant. Once the candle burns all the way to the bottom, it creates a pool and there is a second wick in there for you to burn. So you're technically getting two candles for one, how cool is that??? The great thing about the spiral wick is that it extinguishes itself to prevent spilling, and it leaves just a solid pillar candle. The kids and I were fascinated watching the candle when it was burning, it is so unlike any other candle I had ever used. Here you can see the candle in action so you'll get a better idea of what I'm referring to. Now I've only tried the Cranberry Mango, which is the one that was sent to me, but I am really excited to try the other scents, and there are so many wonderful sounding ones to pick from. Just head on over to Spiral Light Candles and browse through their huge selection. Spiral Light Candles can also be found on Facebook, Twitter, Youtube and Pinterest. 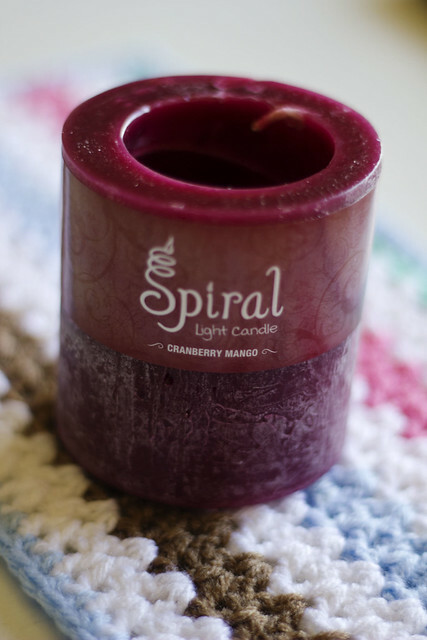 Thank you so much to Spiral Light Candles for the opportunity to review their product. All opinions shared are my own. That is so neat and I can almost smell it here. I'm a candle and a scent fanatic. I better check these out! I love candles and these look great are they just in usa?